We have a small number of books available for purchase for $50 + GST + postage. Contact us for details. 180 people attended the Te Waihora – Lake Ellesmere Living Lake Symposium, organised by the Waihora Ellesmere Trust. They learnt much about the current state of the lake and its values, and about future plans and management actions. The symposium attracted lay people and multiple representatives from all the key management organisations. The symposium featured forums, presentations of science, responses from statutory agencies and field trips. The lake remains extremely important to Ngai Tahu but there are issues surrounding its management and access to resources. Some aspects of water quality have improved but the lake is best described as hyper-eutrophic – only its geography saves it from severe algal blooms. In terms of water quantity, inflows have declined significantly over the last decade and this has influenced lake level management. Indigenous fisheries including the nationally important eel fishery are performing positively although issues remain about management and habitat. The lake remains a wetland of international significance for birdlife with the highest species diversity of any site in New Zealand. Most wildlife values are positive although concern is growing for swampbirds as freshwater wetlands reduce in area and quality. Native vegetation communities are of national significance and are mostly in good condition, including a range of nationally threatened plant species. The once world renowned brown trout fishery is in extremely poor state and requires urgent and concerted management action if it is to be restored. Recreational opportunities are growing but there are issues about access and perception. Economically the lake supports an important commercial eel fishery. Lake edge farming is of local importance (and diminishing as properties are purchased for conservation purposes). Wetland enhancement strategies will need to consider financial costs and benefits, including to neighbouring farmers. Management agencies responded to the state of the lake and will consider these further over the next few months. 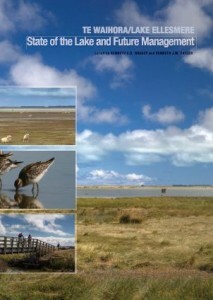 Overall, the most specific responses were from DoC (e.g., commitment to protecting the freshwater wetlands especially via control of the invasive grey willow), Fish and Game (a comprehensive set of actions to restore the brown trout fishery), Ngai Tahu (e.g., management of their resources) and Environment Canterbury (continuation of the Living Streams programme, review of consents and investigation lake weed bed re-establishment). The Vice-Chancellor of Lincoln University, Professor Roger Field, announced plans to investigate a research centre focused on the lake and developed in cooperation with the Taumutu Runanga. The Waihora Ellesmere Trust has now committed itself to publishing the key findings from the Symposium and is considering plans for a Lake Visitor Centre, Interpretation Work and Riparian Management.